A painter with a long and productive career, Leon Dabo was known for his atmospheric, tonalist paintings, especially of the Hudson and East rivers in New York City in early morning and sunset times of day—“silent, introspective times of day that appealed to the Tonalist sensibility. . . he emphasized gentle nuances of light and atmosphere, luminous color effects, and an innovative handling of space”. (Lowrey 124) Dabo also painted floral still lifes, and in the 1920s became a lecturer on art education and on specific artists including John La Farge and James Whistler. Newly discovered research, verified by gallery owner and art historian, Frank Goss has shown that Leon Dabo was born in France in 1864 and not as previously thought in Detroit in 1868. His father was Ignace Scott, an artist specializing in architectural decoration. Dabo grew up in Detroit, Michigan, and was an apprentice to his father before going to New York City, where he worked for J. & R. Lamb studios and associated with John La Farge, painter and muralist. In 1886, Dabo went to Paris where, using letters of introduction provided by La Farge, met leading artists. He studied with Daniel Vierge and Pierre Galland, and at the Ecole des Arts Decoratifs, Academie Julian and the Ecole des Beaux Arts. He also went to Italy and London, where it is thought he spent time with James Mc Neill Whistler in his studio. In subsequent paintings, Dabo reflected Whistler’s influence including his philosophy of ‘art for art’s sake’, his tonalist style, and his use of a monogram as a signature. Dabo later considered himself an expert on documenting Whistler’s paintings, as did others, and Dabo became an authenticator and published writer work by Whistler. In 1892, Dabo returned to New York City. He took up his former career of architectural decorator and muralist of public and religious buildings. He also painted river scenes, initially working in an inhibited-seeming academic manner but then loosening up in what was then regarded as modernist influences. Among those artists whose work had an effect on him in addition to Whistler were French Impressionists and Japanese painters such as Hiroshige and Hokusai. Dabo’s painting career ascended in 1905, when the National Arts Club, of which he was a member, sponsored a solo exhibition of his work, which critics generally praised and which brought him public attention. Prominent collector and Tonalist enthusiast William T. Evans purchased some of Dabo’s paintings, which conveyed special distinction. 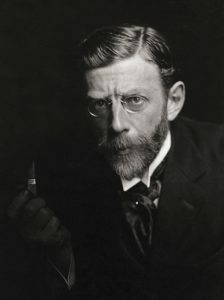 In 1910, he participated in the “Independents” exhibit organized by The Eight in New York City, and in 1913, as a member of The Society of Painters and Sculptors, was one of the principle organizers of the New York City Armory Show that introduced modernist art from Europe to the United States. He was a member of the National Academy of Design, Scholastic Art League and Brooklyn Society of Artists. In 1917, Dabo was commissioned and sent to France in the A.E.F. Corps of Interpreters. In France he also received the Chevalier Legion of Honor award.